From Thanksgiving to Christmas Eve, the outside of Philadelphia City Hall is transformed into holiday central. The scene features a traditional German Christmas Village where more than 90 merchants sell holiday decor and gifts, toys, clothing, jewelry, artwork and crafts, day and night. Shoppers can nibble on seasonal treats and sweets while enjoying live entertainment and programs. 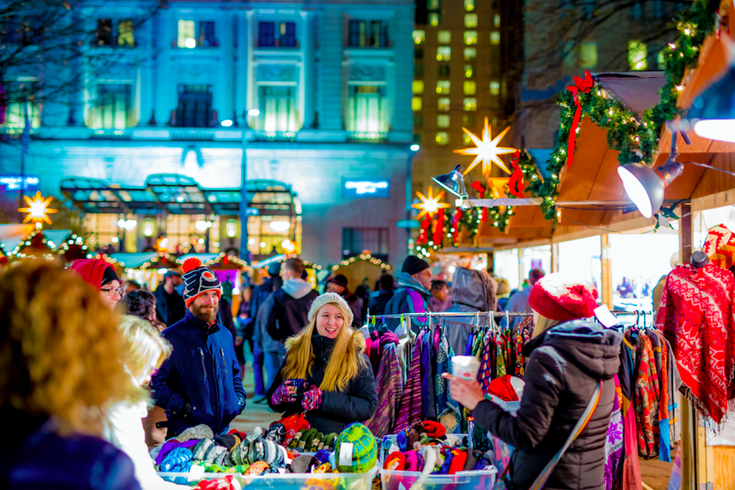 Christmas Village, the open air German market, is a holiday tradition for many Philadelphians. This year, the market will celebrate 10 years as a Philly favorite. Before heading to Christmas Village to shop for gifts and festive decorations, read on to find out location, hours and what's new. Christmas Village will return to LOVE Park this holiday season. Last year, it was at City Hall due to construction. Christmas Village will be open daily from Thanksgiving (Thursday, Nov. 23) to Christmas Eve (Sunday, Dec. 24). Admission is free. Daily market hours are Fridays through Saturdays from 11 a.m. to 8 p.m. and Sundays through Thursdays from 11 a.m. to 7 p.m.
Thanksgiving Day hours are 9 a.m. to 5 p.m. and Christmas Eve hours are 11 a.m. to 5 p.m.
• Christkind opens the market during the Grand Opening Ceremony on Nov. 26 at 3 p.m.
• The Free Library of Philadelphia hosts storytime on Wednesdays at 11 a.m. Since Christmas Village is set up like an open-air German market, many of the foods offered are German or inspired by the country's traditional dishes. 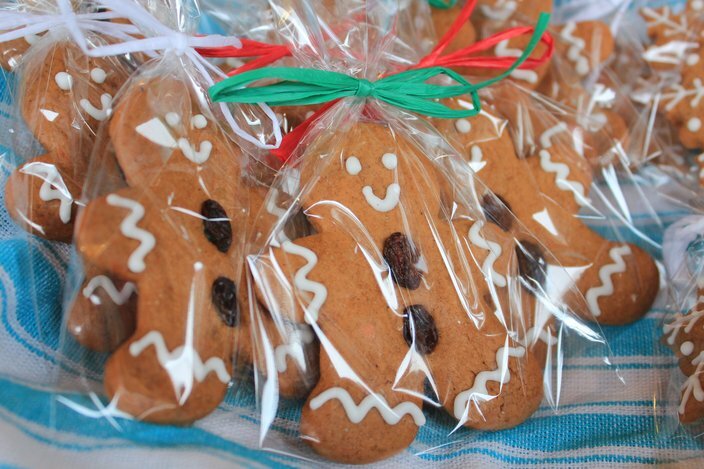 Gingerbread is a delicious treat available at Christmas Village. More than 80 booths, plus a big vendor tent, can be found at Christmas Village. Many of the stalls sell gifts that can't be found at the mall. There are tons of German and international vendors. The various booths offer unique toys, jewelry, pottery, fashion, art, handmade items, decorations and ornaments, among other goods. Find the full list of vendors (and where they are located) here. The Made in Philadelphia Holiday Market is separate from Christmas Village but is curated and organized by Christmas Village organizers. This year marks its third year. It is located at Dilworth Park outside City Hall, close by to LOVE Park. More than 50 artisans, designers, crafters and confectionaries from the greater Philadelphia region sell gifts and holiday foods inside white, festively lit tents topped with original Herrnhut Stars. View the full list of vendors here. The holiday market will be open Saturday, Nov. 18, through New Years Day (Jan. 1, 2018). Daily market hours are Sundays through Thursdays from 11 a.m. to 7 p.m. and Fridays through Saturdays from 11 a.m. to 8 p.m. It will be open on Thanksgiving from 9 a.m. to 5 p.m. and open on Christmas Eve from 11 a.m. to 5 p.m.
Christmas Village now has a carousel! It's located at City Hall, however, and not LOVE Park. The Christmas Carousel was introduced to Christmas Village last year, when it was held at City Hall. 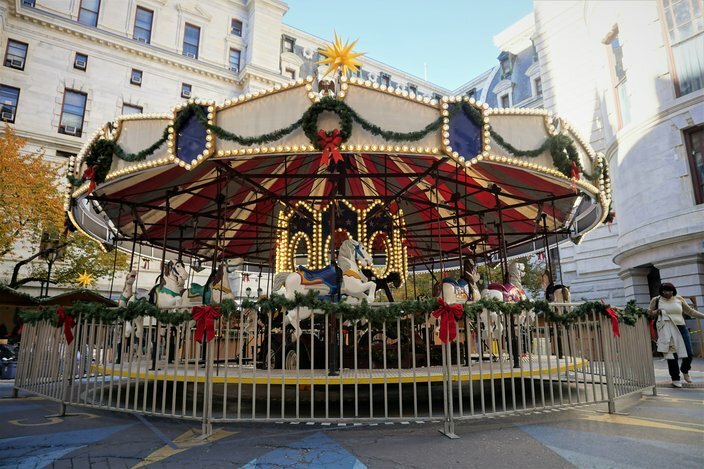 This year, the carousel will once again be located in the City Hall Courtyard. It will open with the Made in Philadelphia Market on Saturday, Nov. 18, and remain open through Christmas Eve.